The king has finally been given the clear to open his castle. The Sandwich King, a gourmet sandwich shop located at 47-31 Vernon Blvd., opened earlier this month after waiting more than six months for the Buildings Department to give them the OK after a gas leak was discovered in the building last year. Nick Giovanniello, the owner, said that he is excited to finally be open after initially planning to start serving customers in May. He said the wait proved costly, as his perishable food items went bad and monthly bills still kept coming in. The shop opened on Jan. 10 and is offering a mix of hefty traditional and gourmet sandwiches made with everything one would find in a deli. A popular sandwich, he said, is the pastrami on rye with mustard. Sandwiches at the 20-seat venue—formerly the home of the Chinese restaurant New City Kitchen Express—cost between $9 to $15 on average. Giovanniello says that he is now gearing up for Sunday — taking catering orders for the Superbowl—as many are requesting his hearty sandwiches for the big day. The venue offers more than a dozen combinations of signature sandwiches that include: “The Legend,” which consists of pastrami, corned beef, melted Swiss cheese and mustard; “The Bull,” made with chicken cutlet, fresh mozzarella with vodka sauce on roasted garlic bread; and “The Williamsburg Windmill,” comprised of homemade roast beef, roasted peppers, yellow American cheese, mayonnaise, lettuce and tomato, served on a hero bread. 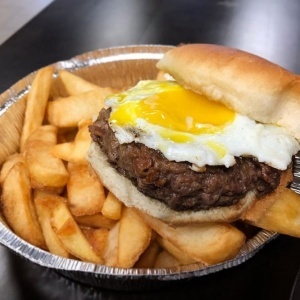 Other food items that are served fresh by the order include Philly Cheese Steaks and the “King’s Burger,” that consists of a large beef patty infused with cheese and bacon bits. Side items include Tater Tots, Chicken Tenders and Mozzarella Sticks. Giovanniello also serves “Bad Intention Fries,” which consist of steak fries sprinkled with chopped chicken cutlet, bacon and covered in melted cheese. Breakfast items such as BLT’s are available seven days a week beginning at 6 am, with a variety of different bagels made on-site daily. Fresh muffins from Morrison’s Pastries are also delivered to the shop. A full catering menu is also available, with the shop offering 6-foot heroes, pasta dishes, and more for this Sunday’s Superbowl. Giovanniello said that many of the sandwiches are named in honor of family members who helped make the store a reality. “The Legend is named after my father, ‘The Bull’ is what we call my brother Gary, and ‘The Williamsburg Windmill’ is what the media used to call my grandfather, who was a famous boxer from Williamsburg that fought under the name Danny Giovanelli,” he said. The Sandwich King is open from 6 a.m. to 10 p.m. Monday through Saturday, and on Sundays from 6 a.m. until a time yet to be determined. The shop is now taking phone orders for delivery and will be available on GrubHub and Ubereats beginning Friday. The official grand opening date is set for Feb. 1. I have not been there, but my daughter goes to school close by. She is very excited to stop in one day soon. Best of luck!!! Great pastrami it rivals Katz the Legend combo was delicious. Best of luck Nick, haters hate! Somewhat surprisingly, the sandwiches here are legit. 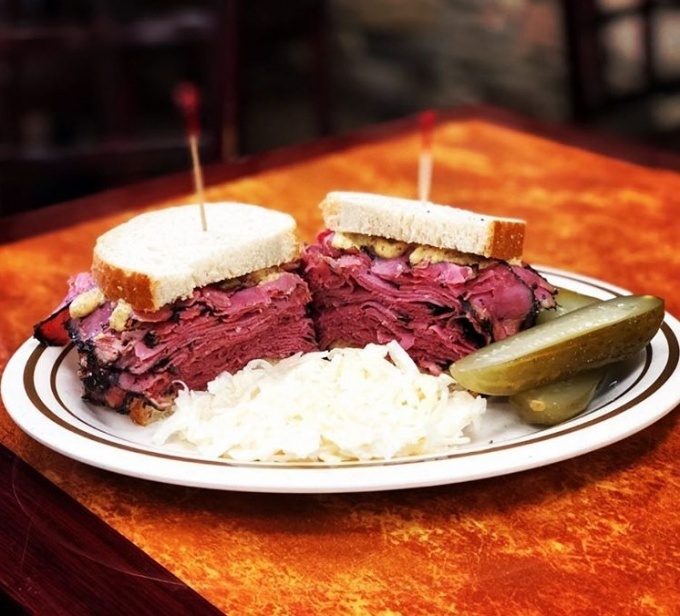 The pastrami is damn good, in particular. They are obviously still shaking out a couple of issues (both times I’ve gone, they’ve run out of one ingredient or another mid-evening, communication in the kitchen seems to be a bit lacking, and they’re still deciding the final menu), but I have high hopes this will be a neighborhood stalwart. Nice. I hope they open their next location at Queens Plaza. Finally! Damn Good Sandwich! Don’t listen to the haters, this place is legit. There is a very slim chance that this place is any good. Over it. Can we get some healthy options in Lic these guys look like they are gonna have a heart attack any minute. Serving cancer all day everyday and I’m not making this up processed meats literally cause cancer and red meat destroying the environment but yeah cool open up a meat heavy sandwich shop in 2019, not what the world or your arteries need. Period. Which part of LIC are you? Under the Newton Creek sewers? There is one of those “salads and coffee” dumps in every corner of LIC, but you wouldn’t realize it because they fail just as fast as they go up. LIC NEEDS more MEAT..period! THere’s a big reason why Sweetchick, Mu Ramen, John Brown, Burger Garage are one of the more successful establishments in an otherwise crummy culinary area. MEAT! Go ahead and open up a place of your own then with the healthier options you and what you feel the neighborhood needs. But, until you have the guts to start a place of your own stay home a steam some broccoli or asparagus during Superbowl Sunday while the rest of us indulge in some classic delicious sandwiches. Yes! We need way more cruelty-free, plant-based, VEGAN establishments across the borough!! Unsolicited review: I went here last week. The food is really good. The wait was really long. I ordered 2 sandwiches from the menu and waited nearly 30 minutes. There were about 15 other customers in the restaurant and they all were dealing with a similar wait time. The people working were nice but all on different frequencies. If they can iron out their lack of any kind of coherent system of production I think they will do very well. A big step up from your average deli sandwich. Great sandwiches and appetizers!highly recommended! 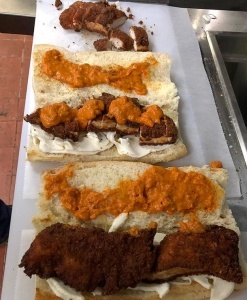 “Gourmet” sandwich shop serving chicken fingers, tater tots and mozzarella sticks. The sandwich combo ingredients don’t seem to make much sense either – just seems like random ingredients thrown together. 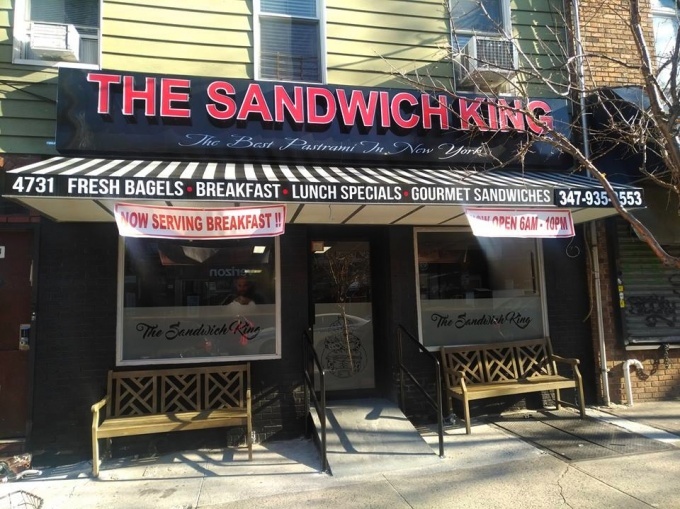 Also, terrible name choice because “The Sandwich King” is the guy from Food Network, so any internet search results are about him, not the shop. There’s also a place with the same name in Flushing, so it’s just going to lead to customer confusion. The photos featured in this article don’t do the place any favors either. It looks like pretty standard deli/diner fare. 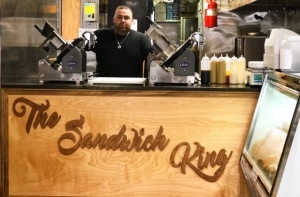 The only Sandwich King we recognize is Sal, Kris, and Charlie’s in Astoria!